Courtesy of the Morris Graves Museum of Art. 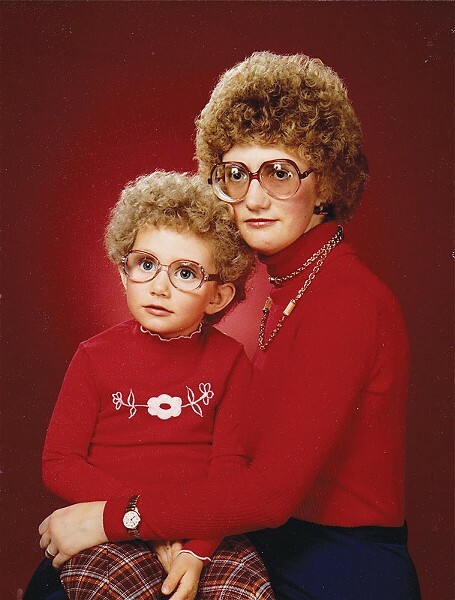 "Like Mother, Like Daughter" is included in the Awkward Family photos exhibit. The photographs are instantly relatable and simultaneously mockable. There are the matching outfits, shirtless potbellies, screaming children and awkwardly posed studio glossies intermixed with candids snapped at the perfectly inopportune time. The best of them capture not just a family, but an era. One collection-defining shot — dubbed "the Magnet" — features a man in his 30s with a tightly trimmed beard and manicured mullet, shirtless with a tuft of chest hair peeking out of his open suede jacket as he cradles a pair of neck-tie wearing cats in his arms. 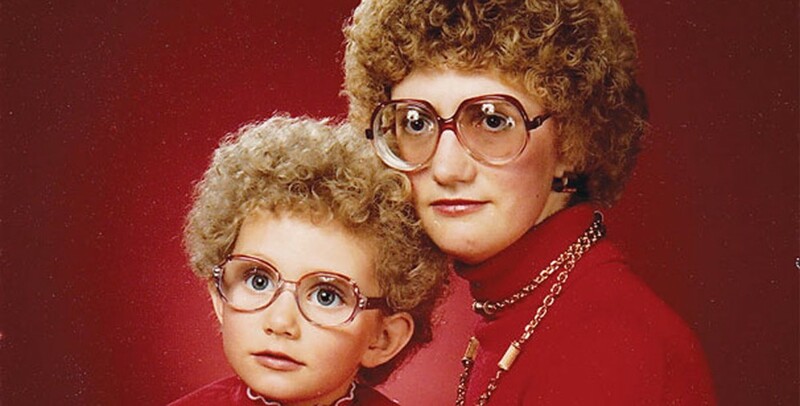 The pictures are part of the Awkward Family Photos collection, which started in 2009 as a modest blog that invited folks to share their uncomfortable family moments caught on film. The site went viral. Now, 200 of the collection's finest are on exhibit at Santa Monica's California Heritage Museum. Their next stop? Eureka's Morris Graves Museum of Art, which in January will become just the third venue in the country to host the exhibit. It's a coup for the small museum, and it comes amid the Humboldt Arts Council's ongoing effort to draw in a younger, more diverse crowd. "We need to humanize the museum," explains Executive Director Jemima Harr. "We need to unite the community with us in different ways than we have in the past." The effort to reshape the Morris Graves Museum of Art and its following was borne out of necessity. Humboldt County prides itself on being an artist community, but its flagship arts institution is struggling to make ends meet. Hammered by the Great Recession, the Humboldt Arts Council — which runs the Morris Graves Museum of Art, maintains the Romano Gabriel Sculpture Garden and offers a host of educational programs — has yet to claw its way back to financial stability. "We don't really want to cry wolf," says the council's board president, Sally Arnot. "But there's just not a lot of money." According to the nonprofit Guidestar — which acts as a kind of nonprofit watchdog by compiling publicly available information about an organization's mission, programs and finances — the Humboldt Arts Council was almost $25,000 in the red in the 2012-2013 fiscal year, bringing in $291,087 in total revenue compared to $315,774 in total expenses. While that might not sound terrible, the down year came on the heels of at least four others, during which the organization scrambled to cut expenses and bring its finances in line. There's no fat left to trim, says Harr, adding that if revenue doesn't pick up soon, HAC will have to start cutting programs. The result of a near-perfect storm of factors, HAC's fiscal woes are pushing the organization to reinvent itself, get younger and attempt to reconnect with the community it has served for more than 40 years. Harr says that since the start of the recession in 2008, the museum has seen its membership cut in half. Of the members that do remain, Harr explains that many folks who were $100-members in 2009 are $30-members today. Similarly, sales from the gallery, exhibitions and other events have dropped by 50 percent in recent years. "People just don't have that expendable income to buy those luxuries in life," Harr says. Arnot says the recession has also increased the need for social service nonprofits. With many families looking at tight budgets and needing to reduce their charitable contributions, Arnot says some are left with tough choices. "I see arts education as humanizing our community and being so enriching for the quality of life here," she says. "But, if you're competing with blankets and food, there's a big difference." Grant funding streams have similarly dried, with governments and agencies across the nation seeing increased applications for a depleted pool of funds. Harr says HAC has been fortunate to get some funding annually from the California Arts Council, but adds the agency always asks why HAC doesn't receive more local governmental support. With both Humboldt County and the city of Eureka struggling in the face of budget deficits, Harr says, "We understand, it's just not in the budget." Compounding the problem, Harr says, is the lack of flexibility on the other side of the budget ledger. In 1996, HAC began the process of taking over Eureka's old Carnegie Free Library, which was built in 1902 and landed on the National Register of Historic Places in 1986. The acquisition — which saw a grassroots fundraising campaign pull in $1.2 million to renovate, restore and retrofit the building — culminated in the opening of the Morris Graves Museum of Art on New Year's Day 2000. The building is a local gem and beautifully houses the museum's exhibits. But it's a huge cost to maintain, with utility bills that Harr describes as "outrageous." HAC has also amassed a large collection ranging from hundreds of relics that capture the history of the area to the works of the museum's namesake, Morris Graves. In 2012, HAC took ownership of the Romano Gabriel Sculpture Garden, which is on display at 315 Second Street in Eureka and which Harr calls "the second greatest piece of folk art in California, and possibly even the nation." But HAC's sprawling collection comes with upkeep and insurance costs. "It costs $1,000 a day to open the doors here," says Harr in a phone interview from the museum. "That covers everything from utilities and water to professional staff and insurance for the collection." Nationwide, museums have been similarly struggling since the recession hit and many have yet to recover their footing. There's also the national trend of declining attendance. According to a survey by the National Endowment for the Arts, only 21 percent of adults in the United States visited a museum or art gallery in 2012, down from 26.5 percent in 2002. Museums were least popular among the nation's least educated, the survey found, with fewer than 10 percent of people who finished their education with a high school diploma attending a museum during the year. In contrast, the survey found 37.2 percent of college graduates made it to a museum in 2012. In Humboldt County — where only 26.4 percent of the population has a college degree, according to the U.S. Census — those numbers paint a dire picture. One of the answers, Arnot and Harr hope, is "blockbuster shows," like the Awkward Family Photos exhibit, that appeal to demographics that don't usually frequent the museum. "If that brings a whole new group of folks into the museum and educates them about what the museum is all about, about our children's programs, then it's a win-win for us," Arnot says. 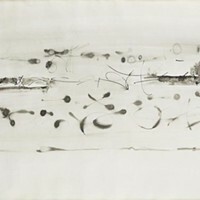 Part of the appeal of a show like this, Harr says, is it's not fine art and it's not traditional. "I think this is something that's going to bring people far and wide here," she says. But attendance is only part of the equation. HAC also needs money. The admission fee Morris Graves began charging in January — $5 for adults, $2 for seniors and students — so far has done little to stem the tide of budgetary red ink. If the community wants HAC to maintain all its various offerings, it needs to step up to the plate. "We just need the community support to be here," she says. "We're not a luxury. We're an essential component of what this community's about, but we can't do it on our own." Arnot points out that folks wanting to lend a helping hand will have plenty of opportunities in the near future: There's the June 28 "Art Splurge," when the museum will exhibit and sell off hundreds of 5-by-7-inch works for $150 apiece while treating visitors to appetizers and refreshments; the Sept. 20 Outstanding Contributions to the Arts Award banquet; and the ongoing "Circle of $100" membership drive, which offers two family memberships to Morris Graves for $100, the idea being a family can purchase itself a membership and give away another. Arnot has been with HAC since its inception in 1971 and while the organization faces challenges that are very real, she says she's optimistic about its future.